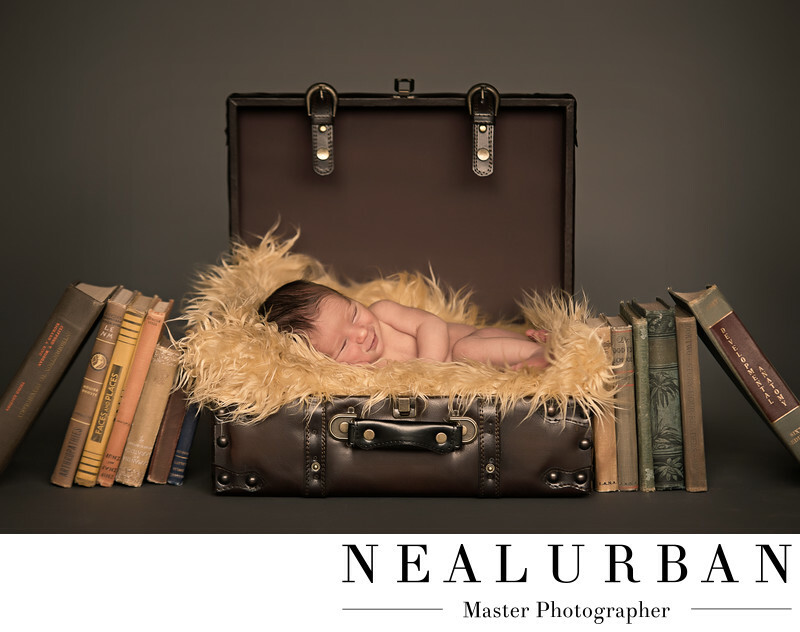 This was a fun newborn session at Neal Urban Studio. Dad is a lawyer and we wanted to come up with something that was specifically geared toward him. Renee and Patrick (parents) may want their son to follow in daddies footsteps! Our wheels were turning to come up with an idea catered to Renee and Patrick. We were hanging out at the studio and I saw the suitcase sitting next to Neal's desk. I took it out and said we should use this. Then we started to brain storm and came up with this. This little guy was such a good baby and sleeper too! We got to do so many different things with him. This was the main shot we wanted, so we made sure to start with this. Then from here, we switched up the sets and outfits. If the baby is milk drunk as photographers call it, we can do many more photos and poses. This is something we all hope for, but does not always happen. If you look close you can tell this baby was in a peaceful sleep. And dreaming of something really good. Look at that little smile!